Raul Midon brings a vibrant sound steeped in classic soul to the pop arena, because pop is where a singer and a song can have the biggest and most widespread impact. When an envelope-pushing song becomes a pop hit, it shifts the entire musical landscape, forcing out the shopworn and cliched while opening the windows of change to let in fresh ideas. The notion of shifting the landscape is this artist's passion; the wide-ranging skill sets he brings to bear on his mission provide him with the tools to pull it off. The New Mexico-born, New York-based writer/vocalist/guitarist burst onto the scene in 2005 with his audaciously original debut album, State of Mind, and he's followed it up with an even more memorable song cycle, one that substantiates the depth of his talent and the degree of his dedication. A World Within a World, the title of the new album (Manhattan Records, Sept. 25), might refer to the status of pop music within the culture as a whole; it could also describe the expansive interior realm that this single-minded artist, blind from birth, has created with his imagination. Midon is bringing currency to a rich tradition of pop inventiveness, combining the beguiling soulfulness of Stevie Wonder, the inventive appropriation of non-indigenous musical elements pioneered by Paul Simon and the trend-defying individuality of Bill Withers. These are mainstream artists who were on the charts and making art, Midon notes. There isn't that much originality in pop these days, because everybody is trying to sound like what they think might fit into the narrow formats on radio. But the best pop is as important as much as any music. I mean, I love Paul Simon or James Taylor or Prince as much as I love Miles. With A World Within a World, Midon aims to do his part to replant the pop wilderness. The album's diversity is manifested with brio in the beguiling settings. The opening Pick Somebody Up, which could serve as Midon's credo, embeds a theme of uplifting social consciousness in an insinuating groove and the sort of lush, uptown soulfulness that distinguished the career-defining albums of Stevie Wonder and Marvin Gaye. The multitracked acappella piece Ain't Happened Yet references the the immediacy of street-corner doo-wop and the exuberance of the Beatles. Save My Life updates the silky '70s soul of the Stylistics and Delfonics, interpolated with the deep funk of the same period courtesy of Midon's wah-wah electric guitar part. References to the perilous world we live in abound on A World Within a World. Tembererana, which employs elements of Argentinean music, pits images of the threat of looming annihilation against the power of creation. The More That I Know ponders metaphysical questions like Why do the children suffer so? And the culminating Peace on Earth places the radical humanism of John Lennon's Imagine in an unsettling contemporary context. I got a few people accusing me of being na•ve on the first album-I don't think I'll get that this time, says Midon with a quick laugh. Midon was born in Embudo, N.M., to an Argentinean father and an African-American mother. A passionate music lover for as long as he can remember, Midon started playing drums at age 4 before shifting his focus to the guitar. He turned down a scholarship in creative writing offered by the University of New Mexico after being selected by the University of Miami for its highly regarded jazz program. Staying in Miami after graduating, Midon became an in-demand backup singer, working primarily on Latin projects for artists like Julio Iglesias, Shakira and Alejandro Sanz, while moonlighting as a club performer, sprinkling the requisite cover songs with the original tunes he was starting to write. On the city's stages, he diligently honed his craft as a singer, writer and guitarist, developing a syncopated, flamenco- and jazz-infused approach to the steel-stringed acoustic. In 2002, when Midon felt he was ready, he walked away from his lucrative profession in order to pursue a solo career in New York City. I wanted to become an artist and do what I wanted to do instead of being someone else's hired gun, he explains. When Midon performed for the legendary producer/arranger Arif Mardin, fresh off the recording of Norah JonesÕ breakthrough album, Come Away With Me, he offered the newcomer a deal on the spot-it would be the final signing of Mardin's long career. Ra�l readily accepted, eager to form a partnership with the highly skilled veteran and with Arif's multi-instrumentalist son Joe. Father and son co-produced State of Mind, which garnered critical accolades for its heady fusion of old-school soul, timeless pop, Latin, jazz and the singer/songwriter idiom. Intrigued by what the youngster was cooking up, Wonder himself appeared on one track. This is not your average pop record-not by a long shot. With A World Within a World, Midon has fashioned an album that is at once audacious and accessible, of the moment and suffused with history; it's personal yet universal, uncompromising yet inviting. This is that rare sort of pop album that could actually make a difference, and as such, it stands right alongside the pivotal works of the artists who inspired it. All About Jazz musician pages are maintained by musicians, publicists and trusted members like you. Interested? 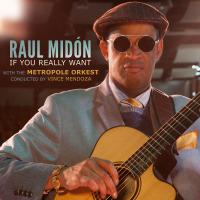 Tell us why you would like to improve the Raul Midon musician page.